1. A sign that remains to show the former presence of someone or something which is no longer around. 2. A tiny amount of something, a barely perceivable indication, or an amount of something which is detectable, but which is too small to be quantified (measured or counted). 3. Footprints, visible marks, or other physical signs of the movements of humans or animals; such as, footprints, that have been made or left by the actions of people, animals, or things. 4. An attempt to find or to follow someone or something. 5. A constituent, such as a chemical compound or an element, present in quantities that are less than a standard limit or amount. 1. To find out where someone or something is or who or what anyone or something was; such as, to trace a wounded buffalo; tracing a missing child. 2. To follow or to show the course or series of developments of something, or be able to be followed back in time or to a source; for example, to determine the successive stages in the development or progress of someone or something; tracing the life cycle of an ant colony; traced the history of a family ancestry. 3. To copy writing, a design, or drawing by putting translucent paper on top of it and drawing the visible outlines on that paper. 4. To locate or to discover something by searching or researching available evidence; such as, to trace the cause of a disease or a mental illness. 5. To locate origins or to be able to locate the linguistic features of words back to their beginnings: "Scholars can determine the historical origins of English words by tracing them to their Germanic, French, and Latin or Greek origins." 1. 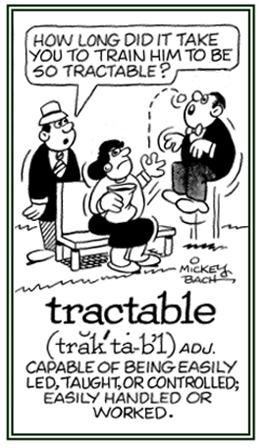 Being easily managed or controlled; docile; yielding. 2. That which can be easily worked, shaped, or otherwise handled; malleable. 1. Capable of being easily taught, led, or controlled; docile and manageable: Jim's little boy has been a very tractable or obedient child. 2. 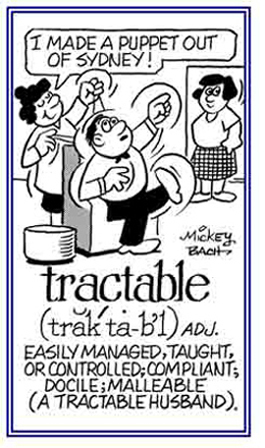 Etymology: from Latin tractabilis, "that may be touched or handled, workable, tangible, manageable"; from tractare, "to handle, to manage." © ALL rights are reserved. A collector of steam rollers.